New product design contest on Desall.com: URMET ATE and Desall invite you to design a new device working as a HUB for the safety of the entire family, able to provide telecare, assistance and monitoring services. URMET ATE has been part of the URMET Groups in Torino since 2003, but its history and experience started much earlier under the name of ATE-TVS. The company is active in the field of surveillance institutes and remote assistance since 1991, and since then it has designed and manufactured specific applications and devices. 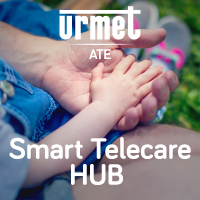 URMET ATE invites you to design a new HUB conceived for the safety of the entire family, able to connect to the mobile network and to manage via Wi-Fi several sensors and monitoring devices, to guarantee the safety of the entire home in a discreet and reliable way. The device will be supplied with a remote consisting of a single emergency button able to activate a call for rescue. Product typology: the HUB you suggest will embed several technologies, able to offer a multifunctional and connected device. It shall have a discreet, intuitive and reliable design, placing at the centre of the entire development the user experience and able to convey a sense of safety for the entire family. The remote will be a discreet and wearable device, with a design in line with the HUB and consisting of a single emergency button. Context of use: the HUB will be installed inside the home environment and will be connected to the telephone network. In case of need, one will be able to send an emergency signal through the alarm button of the HUB or through the remote, that in addition to sending a pre-set alarm message will also start a speakerphone emergency call to the number set by the user during the setup. The HUB will also be equipped with another button, capable of starting speakerphone calls to other pre-set numbers. With a view to the future development of the device, in addition to providing telecare and call functionalities, the HUB will receive and process signals from other connected devices and sensors, including for example smoke, gas sensors, etc. in order to guarantee the safety of the entire family and home environment. The HUB you suggest will have an intuitive and functional design and will include the various elements described below. With a view to reduce the number of components, you can suggest modalities and solutions that – for example – embed the buttons inside the chassis. -	One emergency button, easily identifiable, intuitive, practical and easily accessible: the user shall be able to activate the button and start the alarm state also in difficult situations, sudden illness or emergency. -	Two buttons, smaller in size than the emergency button, 1 of which dedicated to the activation of a speakerphone call and 1 button for the alarm reset. These buttons will be easily accessible but will have a lower importance in the overall design, to leave maximum prominence to the emergency button. o	POWER INDICATOR – it signals the power status of the HUB (connected to the electric grid, battery modality, low charge battery, etc.). o	ALARM INDICATOR – it signals the detection of an alarm signal received by pressing the emergency button or by other connected devices. o	SERVICE INDICATOR – it will provide information regarding the maintenance of the HUB, its malfunctioning, the connection to the mobile network, etc. o	COMMUNICATION INDICATOR – it will provide information regarding the connection to the cloud. For the SERVICE indicator, you can take into consideration the possibility to suggest other ways for the light diffusion that do not necessarily imply a single-light LED. Instead, the POWER, ALARM and COMMUNICATION indicators will have to be single-light LEDs. -	One microphone: mounted on the PCB and connected to the chassis through a conduit. From the outside you will see only a hole. In order to maximise the performance of the microphone, you are invited to place it frontally and away from the speaker. -	One speaker: it will be placed in such a way as to offer an optimal audio for the user, including possible openings in the chassis with elements such as grids or fabrics, that may still prevent the accumulation of dirt or dust. The maximum size for the speaker is 60mm for the diameter and 20mm for the height. In order to facilitate your design, you are invited to use the 3D file attached. In particular the HUB will have the following elements directly connected to the PCB that you can position at your discretion. They will nonetheless be accessible from the chassis, placed on the same side and aligned among themselves. -	1. Mini USB power connector: a USB cable connected to an external power adapter will be plugged into this connector. You are required to provide a cable-clasping element directly on the chassis of the HUB so to prevent the accidental removal of the power cable. -	2. RJ11 connector for external telephone connection: in case of need the HUB might be connected to an external telephone. -	3. RJ45 Ethernet connector: used to connect the HUB to the DSL network. -	4. Three-pole connector: it will be a terminal strip with three cables to plug in external devices (sensors or activators). -	5. SIM card holder: this card holder will have to be accessible from the outside through a slot in the chassis of the HUB, through which you can insert the SIM card. Ideally, this card holder will have to be positioned in such a way as to prevent the accidental pressure of the SIM card – thus its removal – while handling the HUB. -	6. Battery pack: the HUB will be equipped with a battery pack able to supply power during the disconnection from the power grid. The battery will have the following size: 52,5 × 43,5 × 14,5 mm. In addition, it will have to be accessible for replacement, while preventing the accidental removal while handling the HUB. -	7. Standard USB connector to recharge external devices: for a better user experience and a much practical access, you can evaluate to position it on the other sides of the HUB with respect to the other connectors. In the Material files you will find the 3D files of all these elements in order to reuse them in your design. Remote: the remote will be wearable as a pendant and/or on the wrist and will be equipped with a single emergency button, easily identifiable by touch but designed in such a way as to prevent accidental pressure so to avoid false alarms. It will also have a LED status light. Size of the remote: the remote will have compact dimensions but will have to accommodate an internal PCB measuring 28 × 28 × 7,5mm. Shapes and style: the HUB can have a horizontal or vertical development, while guaranteeing the maximum stability, especially in emergency situations where the user should activate the alarm button during a sudden illness, faint or other unfavourable circumstances. You are free to explore the shapes and style that you prefer, while favouring a discreet, modern and technological style, with minimal and hi-tech shapes. The HUB and the remote will have to share a common style. You are also invited to think about shapes and details that allow a practical cleansing of the devices and that may prevent the accumulation of dirt and dust. You are free to suggest possible finishes or surface workings. Nice to have: the projects showing an advanced development of the plastic materials, related couplings (snapfits, clips,…) and the housings for the internal components will be evaluated particularly positive. In case the selected project had not developed this area in a satisfactory way, it will nevertheless be required during the revision. Materials and production technologies: the remote and the HUB will be realised with injection moulding technologies for plastic materials. In order to optimise the production costs, think about solutions that employ the least number of moulds. Logo: the URMET ATE logo shall be present both on the HUB and on the remote. Use the logo attached in the Material files. Target: the HUB and the remote you suggest shall be used mainly by a senior audience, however thanks to the new functionalities of the HUB it will soon address the entire family. Accordingly, the target consumer will be a person aged between 25 and 55. Values to convey: the HUB shall be able to convey with the intuitive and functional design, ease of use and safety, so to be perceived as a device for the safety of the entire family. Deliverables: upload all the images that better present your projects (rendering, descriptions, CAD files, etc.) and, if necessary, remember that you can also attach a .ZIP archive containing extra materials. Participation is free of charge and open to designers and creative talents of any nationality aged 18 years or older. Participants can present one or more projects, but only the projects published on the www.desall.com web site, via the upload page related to “Smart Telecare HUB” will be accepted. The selection of the winner by URMET ATE will be the result of an unquestionable evaluation and it will take into account originality, feasibility and consistency with the brief presented. For the duration of the option right, the Sponsor offers an extra chance to all participants setting a price of Euro 2,500.00= (two-thousand-five-hundred/00) for the purchase of the license for the economical exploitation of the projects not-acknowledged as the winning proposals. For a better understanding, we have further specified the dimensions of the PCB of the hub, please check out the updated paragraph inside the "Characteristics of the HUB" section. Do you want to stay updated about "Smart Telecare HUB"?